Point Lookout starts from 409 and climbs 2 miles to the top of 409.5. 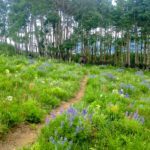 One of the newest trails around CB, Point Lookout affords sweeping views of the valley, smooth singletrack, fields of wildflowers, and is a great way to make all kinds of loops with the other Cement Creek trails. It’s a heck of a climb, but coming from Walrod towards the Caves makes it a wonderful descent. 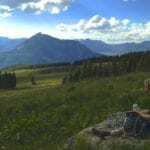 The Pioneer Guest Cabins are located inside the Gunnison National Forest but only 8 miles from downtown Crested Butte. Our 8 historic cabins are nestled in spruce, fir and aspen groves at the base of majestic Cement Mountain. The cabins are nestled in the heart of the beautiful Elk Mountains and along pristine Cement Creek. 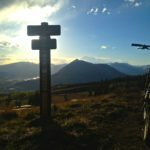 Our location strikes the perfect balance for truly being away from it all while being close enough to enjoy all historic Crested Butte has to offer.